Line is their new car-sharing service that allows you to share a ride with another passenger going in the same direction/area. 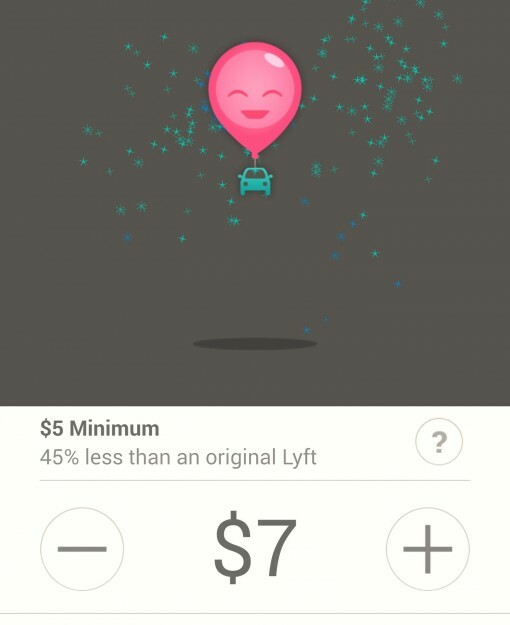 By sharing the car to your destination with a stranger, you’ll also share the cost of the ride — which Lyft says can save up to 60% of what you would pay alone. Not bad. The great thing about the Line service? It’s so new that there aren’t that many people using it so because there aren’t a critical mass of users on Line, if the system can’t match you with anyone going in that same direction, then you basically ride by yourself for the price of the shared ride. In my experience, I was turned onto Line because it was Primetime and they were tacking on an extra 75% to the final bill. Since I wasn’t in a hurry, I tapped on Line option. The system went about trying to match match my route with another passenger. The Line system searched for other passengers for between 1-2 minutes, but ultimately I was alone in my Lyft and the system told me that I saved 45%. I don’t think that 45% number was accounting for the additional Primetime tip. By my calculation, for a trip I ended up paying $5 for on Line, I would have paid $7.25 (+45%) under normal Lyft pricing. However, another $5.43 would have been added because it was Primetime (+75%). So for a trip that could have cost me $12.68 during Lyft Primetime (before tip) cost me $5 – that’s a saving of 153%. Gambling on using Line this early in it inception, there’s a good chance you can get to your destination as the sole passenger. With that you’ll get the cheaper “Line” fare. Don’t worry, the driver still gets paid the normal rate of the full ride because Lyft eats the cost as the company continues promoting their service in their all-out war to get a leg up over the scumbags over at Uber.